The StarMansion from “Star Trek: Mill Basin” has landed on the market once again after few interplanetary laps–one of which included a precipitous price-drop from $30 million to $17 million in 2014–this time even bigger and better with some stellar cargo added. 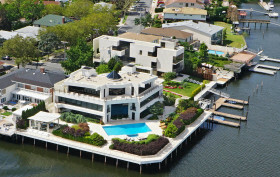 The slightly notorious former mob manse currently belonging to the family of “the Russian-American Paris Hilton” (h/t Curbed) is also the one-time second-most expensive home in Brooklyn (after this massive pad at One Brooklyn Bridge Park). With some seriously tricked-out custom interiors and features like a “circular meditation room,” 257 feet of waterfront, indoor parking for six cars, a Lalique fireplace mantel, 1,000-square-foot pool, spa, outdoor pavilion with kitchen, three-boat marina and water views from every room, the waterfront mansion is still asking $17 million, but with a sweet two-for-one deal attached: The next-door “guest house” property–formerly listed at $8 million–is included in the price. 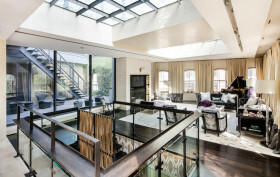 When you think about a home with a pool, a full-house backup generator and a three-car garage, downtown Manhattan probably isn’t the first location you think of–but this off-the-hook urban mansion at 2 North Moore Street in the heart of Tribeca could rival many a compound in the Hamptons. 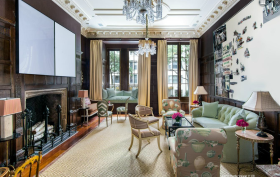 The turnkey billionaire’s bunker was built in 2008 and purchased in 2010 by financier Mark Zittman for $24 million, who hit recycle and put it back on the market unchanged in 2014 for $48M; after having no luck finding a buyer, the price was reduced to $46 million, 50-foot skylit lap pool pool, three-car garage and all. Now, with a $1.5M reduction, the search continues. The fact that you could fit an entire hotel inside this 11,200 square-foot dusky-hued modern masterpiece (whose facade actually does resemble a chic downtown boutique hotel a bit) will surely appeal to someone, though there’s definitely a limited market for eight-figure suburb-in-the-city dwellings, so it may take a while.